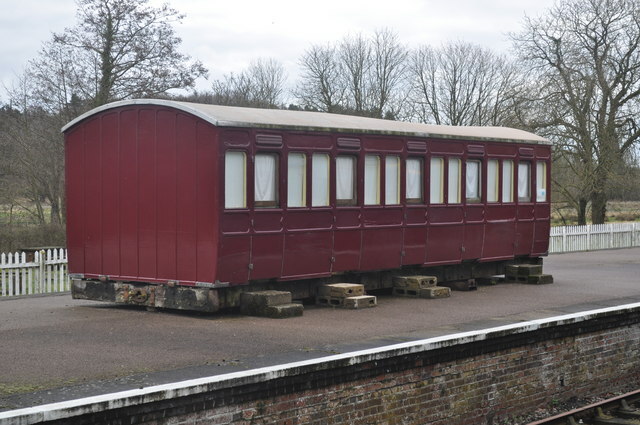 This carriage was built in November 1892 at the Stratford works of the Great Eastern Railway to works order S30 for the London suburban traffic.It is 27 feet long and was fitted with Westinghouse brake equipment and gas lighting.A total of 294 were built to this design.It was withdrawn from service on 4th October 1925,ending its days on the Chingford and Enfield lines.The body was then used as part of a house in Fordham until 1999. The branch line was one of the longest lines in East Anglia, running from Wymondham Abbey to Wells next the Sea, through four major Norfolk towns. This page has been viewed about 480 times.